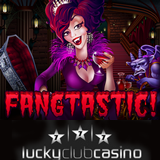 Nuworks introduced a new game this week, a vampire slot called Fantastic, just in time for Halloween! Lucky Club Casino is my favorite Nuworks casino and they're giving a casino bonus up to $200 that includest 66 free spins to try it. To claim it use coupon code FANGTASTIC66 when you deposit. This is valid until October 31, 2015. This seems to be the year of the "vampiress". First there was the new Bubble Bubble at RTG casinos, and now Fangtastic! In this one, flaming dice trigger up to 66 free spins with a 30X win multiplier. The total of the triggering dice determines the number of free spins. Then they're rolled again to give the win multiplier for the free spins. Lucky Club Casino has dozens of unique games from Nuworks Gaming and welcomes new players from all over the world with an up to $1444 match bonus. Details about this and other bonus offers are available at: http://www.luckyclub.eu/promotions.